This pack has been UPDATED from 7 games to 10 games! Game helpers (mini hundred boards and tens frames) are now included to support players during game play. This pack now includes 10 game boards. Games cover first grade skills in adding and subtracting one, doubles to six, number words to six, addition to ten, fives quick facts, number sequence, and hundred board fluency. Games are for partners and may require dice, spinners, and/or game markers (counters or cubes). 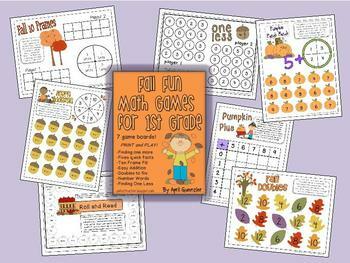 An overview sheet of all games/rules is included as well as fall themed game markers. 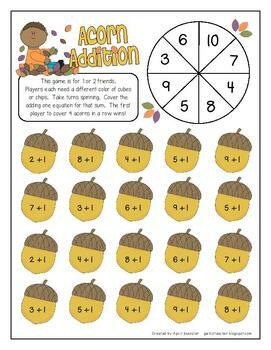 •Acorn Addition – Find the “plus one” equation for the sum. •Pumpkin Plus – Add numbers under ten. 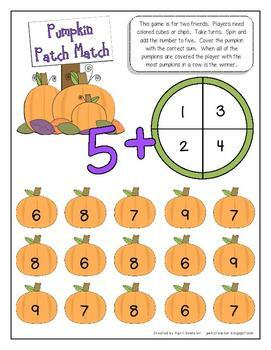 •Pumpkin Patch Match – Add 1, 2,3, or 4 to number five. •Fall Doubles – Find doubles to six. •Roll and Read – Read number words to six. •One Less – Roll and find one less. These games are ready to go! Simply print and play! 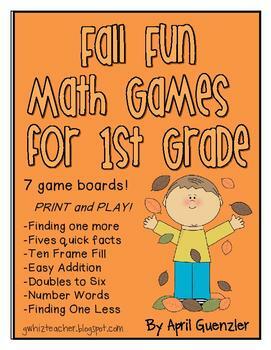 Use with first graders as they practice foundational skills during math rotations or Daily Five math centers. Games can also be used as independent practice for second graders as well. Games are great as a take-home activity or as a reward for early finishers.